Discussion in 'The Small Company Luthiers' started by jaxn slim, Jan 21, 2012. NAMM was getting too crazy, and after almost 3 days, we were ready to see something else. Me and a few buddies made it over to the the American Amp & Custom Guitar Show, and I had the pleasure of meeting Jim Soloway and Doug Kauer. They were both so cool and took the time to show us their gorgeous guitars and explain their approach to designing them. After showing me 6 or 7 of their guitars and letting me play around with them, Jim handed me the Loon, and I was instantly hooked. He let me play around with it for a few minutes and went to talk to someone else. He came back about a minute later and without me telling him anything he said, "That one's your favorite, huh?" It must have been obvious. It just felt perfect, sounded so articulate, and resonated for ages. It's my first hollowbody and my first guitar by a small luthier. Here is a photo of all of us. Nice one. Thats a gorgeous guitar. That is a beauty. Congratulations! Congrats!! Awesome guitar by some awesome guys. Enjoy. That is one beautiful gold top! You will love that guitar!! Shawn thank you so much!!! What a pleasure to meet you!! Couldn't have gone to a better home! For those that are interested, this is a unique Loon. Besides being the first Goldtop Loon it's also the first Loon with a Spanish Cedar body and neck! 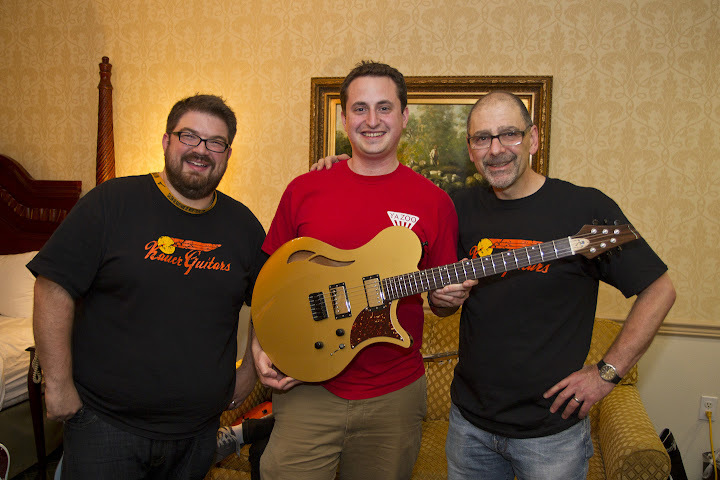 Jim and I were discussing idea's about this guitar and I'm such a large fan of Spanish Cedar that I thought we should give it a try. To me this is THE Soloway for people looking for a little of the 175'ish mid range compared to the normally flat or scooped Swan or Gosling tone. While I wouldn't call it overly mid-rangey (far from it) it just has a little different warmth in that range which is very cool. I think the Loon's will pretty much be standard this way from now on (except on special request). I played that one at the show, it was by far my favorite in the booth, you definitely scored!!! The first time you play a Soloway is a real eye-opening experience. Congrats on getting in on the next wave! Great Pic, welcome to the Soloway/Kauer club! Just ordered my T-shirt LOL. Thanks, everyone. I'm still all tingly. I'll have to email about a shirt, too. That is one beautiful guitar! Enjoy. That is why I don't do my own demo's! I was there on Friday evening and got to play your guitar. WHATTA GUITAR!!! All of the guitars in that room were stunning. I fell in love with Jim's personal guitar as well as the Redwood one. And such nice folks. Later that night, Jim was playing Ken Parker's guitar in Ken's room over at the Hilton and I got to hear several songs. Jim is a GREAT player. What a wonderful evening. Congratulations on your new guitar. I know first hand just how great it is! Nice stuff in that room. Holy smokes! That sounds killer! I just hope I can do it justice.